We took a few test drives when Santro was launched. Was shopping around for a small automatic hatch for my wife & city use. Main competitor was Tiago till the last moment. But a supersize entry won our hearts- that was grand i10. With the discounts, price was very very close to that of Santro. Went for Magna automatic with dual airbags and ABS. Congratulations on your new purchase. If you don't mind, can you share the total cost for your car? What was the amount of discounts that you received? Also, you mentioned mileage as one of the cons. What is the mileage that it is giving you/likely to give in city traffic? I arrived in Lucknow at a friend's place a week or so ago to find an automatic i10 parked outside. Later in the evening we went out for ice cream, and after some time I was highly impressed with the way the car was running / changing gears. Double-checked and realized I was riding in a new Santro AMT which he'd just bought - in the dark I hadn't realized I'd got into a different car! Re: the AMT, it's almost uncanny - the thing just seems to "know" (unlike about 80+% of the human operators of [manual] gearboxes whose cars I ride in) exactly which gear it should be in all the time, and when it should be changing. Very few glitches observed there, they've really done fine work mapping the control system, and its having five gears is pretty impressive too, REALLY amazing compared with the old-school automatics of yesteryear, which having minds of their own continually annoyed me. One interesting effect I observed of not having a traditional torque converter is that it'll roll backwards even on a mild incline if you don't keep a foot on the brake. It really drives like a manual in this and other respects. I liked it. Very efficient, too - I think it was showing somewhere around 15kmpl if memory serves, he had 2000km's on it, doesn't drive very conservatively, and probably almost entirely in the city. Really good for an automatic, I thought. Re: Ignis comparisons above, I dunno - I really like the Ignis styling from most angles, but straight on from the rear the track just looks unnaturally wide to me, the cabin unnaturally narrow. The Santro is more conservative and "uninteresting", and the grille looks bad (ill-proportioned) in almost all the photos posted, but as I said earlier, in real life it looks just fine to me. My friend's was something like a champagne/copper color and I thought it looked good in it. Yes, other competitors may look subjectively better or more distinctive, but I feel the Santro is decent-looking, and like anything else can probably be enhanced / refined a bit with alloy wheels and perhaps some light use of graphic appliques. I was wondering what it would look like with the grille's lamp surrounds painted body color vs. black, for one thing. Interior to me seemed nice enough, nothing there I'd complain about in terms of materials / looks at least. The new Wagon-R is IMO the best-looking version yet, but don't know how comparative pricing works out with all the option packages, etc. Somebody more knowledgeable must've already commented on that. On the basis of pure looks and utility (luggage space, etc), I'd say it would probably tempt me more... specially as neither me or the wife feels any need for an automatic (she thinks driving one would be boring). Last edited by ringoism : 3rd March 2019 at 16:28. We are in the market for a AMT hatch. Checked out the Polo GT, Santro, Ignis and Celerio. We liked the Polo GT but moved on as it is way over the budget. Ignis and Celerio are good in terms of safety and feature list. We are deciding between these maruti duo. I recently bought the new Santro. The big challenge I'm facing is that the steering is too light and second, the steering does not come back to its position after a full turn. Is this issue of not coming back to orginal position for all or is it a flaw in my car?? Want to replace my 2004 Santro xing and did the TD for new Santro. Was'nt too impressed, somehow I am inclined to Grand i10. 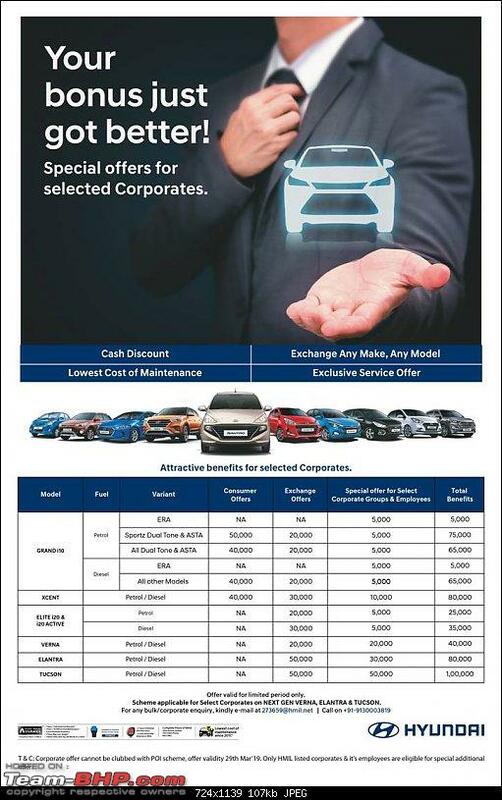 Can someone share how much discounts are being offered for Grand I10 magna automatic? Also, is there any concern related to support continuity for this product over next 5 years? I think Grand i10 would be a better option as it has the proven and reliable TC. And it also scores in terms of power, refinement and safety(only downside would be mileage).. One my friends chose grand i10 sportz AT over santro just for these reasons and of course the additional airbag. Regarding support continuity, i think that shouldn't be a problem. With the Prime cabs plying on the roads, spare parts should be easily available I feel. Just a small advice, with the discounts running it would be better if you buy the sportz AT. It's more VFM I feel. Just my opinion. Ignis and Celerio are good in terms of safety and feature list. We are deciding between these maruti duo. Isn't there a ruling coming up that all new cars from April 2019 should have dual airbags? I would suggest you check if that indeed is the case and if so, you may want to wait it out if you're definitely interested in the Santro. If I were you, I would consider Ignis as a strong contender. External appearance is subjective but the car feels bang for the buck. Based on my 2004 Santro Xing experience I bought another one in 2013. Now thought of continuing the legacy with new Santro but it disappointed me big time. Engine is same but Hyundai seem to have tuned it for performance and hence low speed pull is really bad. During TD it was crying to pull two people with AC on. My xing pulls fantastically even with 4 people on board and AC on. Felt really bad and hence going with a Tiago. Isn't there a ruling coming up that all new cars from April 2019 should have dual airbags? It is a shame that the norms mandate only a driver-side airbag and not dual airbags. I agree that Ignis is a better option. As I learned today, Figo 2019 refresh might bring the dragon AT in the lineup. I will wait till 15th of this month for the launch. That's a real shame. What good is it from a safety point of view that a driver has the safety net of an airbag while the person sitting right next to doesn't get one! I've seen some of the pics for the Figo 2019 and I have to admit it looks nice. Hopefully it will be worth the wait for you. I recently test drove Santro and the steering is just lifeless, forget any feel there is no weight to the steering even at 60 kmph. Unfortunately you cant do anything about it. In comparison my Tiago's steering is well weighted and precise which i pointed out to my relative who was looking to buy the Santro. and second, the steering does not come back to its position after a full turn. Not an issue with your car but it may have to do with the overall steering geometry. Even in the test car the steering wasnt self centering as i expected it too. I am inclined to Grand i10. 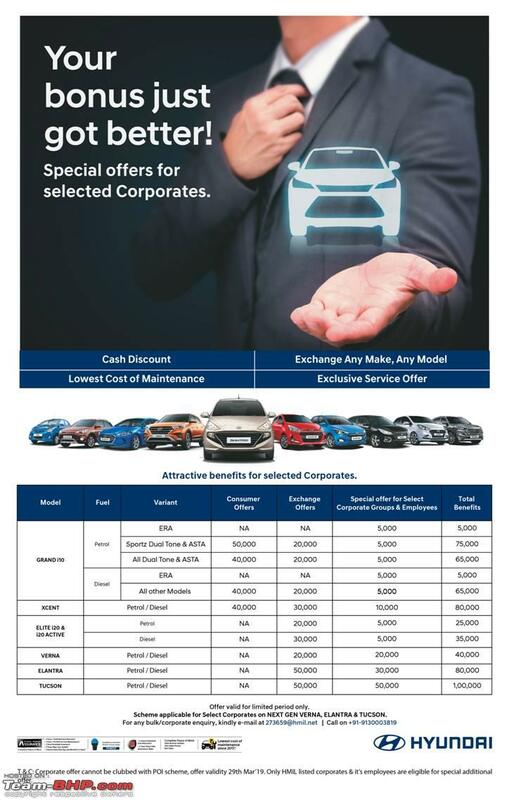 Can someone share how much discounts are being offered for Grand I10 magna automatic? This is the e-mail I got today, about all the discounts going on, this might help you. The Xing ERLX models (post 2005 if I recollect correctly) had AMAZING low end torque! The driveability at City speeds was just astonishing. Sad to know that the new Santro has lost its personality!! I upgraded to the Jazz - which has a notoriously poor low-end, which makes me miss my Xing all the more. Maruti really pulled off a masterstroke with the WagonR’s 1.2L offering though (we broke the scoop ). I’m sure Hyundai totally didn’t expect economy-minded Maruti to do that. Would one choose the car with better quality (Santro) or the better engine (WagonR)? That’s a tough one, especially for an engine-minded guy like me. Am spending this weekend with the WagonR and the answer is clear to me = WagonR! For a spacious, practical & ugly breadbox, the WagonR 1.2L has one heck of an engine! I'm enjoying revving it . Even the short-throw gearbox is fun. The Santro might have better build etc., so while some might prefer to admire the interiors, I prefer to admire the engine. Of course, when it comes to AMTs, I'd pick Hyundai's over Maruti. Last edited by GTO : 10th March 2019 at 12:47.